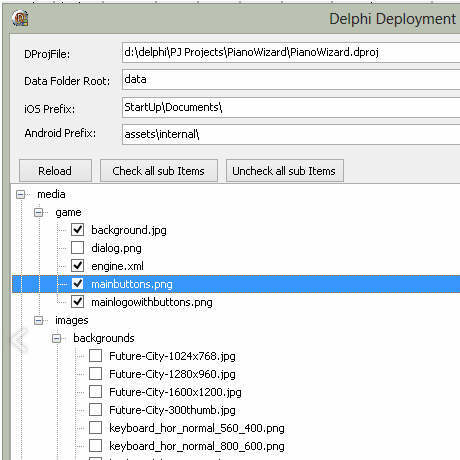 If you’re attempting to deploy your mobile app to both Android and IOS with Delphi XE5 Firemonkey with a lot of included files you may have need of this utility. Pavel Jiri Strnad has created a utility to help you deploy lots of files to Startup\Documents\ on IOS and assets\internal\ on Android. Basically it will add or edit the external files paths in your project file for the platform that you are currently deploying to from a root data directly on your IDE machine. When you use the System.IOUtils.TPath.GetDocumentsPath function in Delphi XE5 that is the directory you will be accessing on each individual platform. The utility is free to use but I haven’t tested it out yet. Leave a comment if you use it and it was helpful to you. Check out the blog post about the utility. I have also provided a mirror of the download in case it disappears. Download the Delphi Deployment Corrector utility directly.